As the name suggests, British Champions Day is a single-day race meeting, staged annually in October at Ascot Racecourse, Berkshire, and marks the culmination of the British Champion Series. Since its inception, in 2011, British Champions Day has become one of the most prestigious and valuable events in the British sporting calendar and, in 2018, the total prize money for the six-race card was a record £4.35 million. 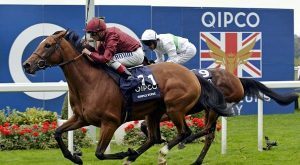 The British Champion Series consists of 35 major races run during the British flat racing season – including the five ‘Classic’ races – and is sponsored, like British Champions Day, by QIPCO Holding, one of the leading private investment companies in Qatar. The first five races on British Champions Day represent the final, decisive round in each of the five categories in the British Champions Series, namely Sprint, Mile, Middle Distance, Long Distance and Fillies & Mares. The Group 1 British Champions Sprint Stakes, run over 6 furlongs, was inaugurated, as the Diadem Stakes, in 1946, but was renamed in 2011 and is now the finale of the British Champion Series Sprint Category. The race was elevated to Group 1 status in 2015. The finale of the British Champions Series Mile Category, Queen Elizabeth II Stakes, was inaugurated in 1955 and achieved Group 1 status in 1987. The finale of the British Champions Series Middle Distance Category, the Champion Stakes, run over 1 mile 2 furlongs, has been a Group 1 contest since the European Pattern race system was introduced in 1971, but was inaugurated, at Newmarket, in 1877. The Group 2 British Champions Long Distance Cup, run over 2 miles, was also inaugurated at Newmarket, in 1873, as the Jockey Club Cup. The race was relocated and renamed in 2011, and elevated to Group 2 status three years later. The Group 1 British Champions Fillies & Mares Stakes, run over 1 mile 4 furlongs, was inaugurated in 1946, as the Princess Royal Stakes, but was transferred to Newmarket, as the Pride Stakes, in 2008. The race moved back to Ascot, under its current title, in 2011 and was elevated to Group 1 status in 2013. Not to be confused with the now-defunct Balmoral Handicap formerly run over 5 furlongs at Royal Ascot, the final race on British Champions Day is a new version, run over a mile and worth £250,000 in total prize money. Now the most valuable one-mile handicap in Europe, the Balmoral Handicap was run for the first time, in its current guise, in 2014.